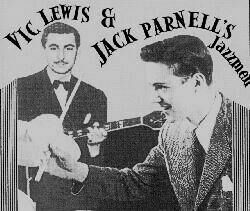 When he left Heath in 1951 Jack Parnell formed his own band known as Jack Parnell and his Music Makers. The programme detail from 'Fancy Free' at the Prince of Wales Theatre, London July 26th, 1951 gave the band lineup as: Jimmy Watson (tp), Harry Roche, Jimmy Wilson, Don Lusher (tb), Bob Burns, Ronnie Scott, Dave Shand, Pete King (saxes), Max Harris (p), Sammy Stokes (b), Jack Parnell (d) + 3 violins. With the start of Independent Television things changed again and as Val Parnell and the Grade brothers, also related to Jack Parnell, were involved with Associated TeleVision (ATV), the company that had won the London weekend and Midland weekday contracts, he was invited to come "off the road" and bring a band onto TV ending his jazz career for good. When the end came for ATV in 1982 Jack Parnell took the opportunity to retire from full-time music. Up until it was disbanded at the end of 2000, Parnell used to play (also sing and tell the jokes for which he has become known) with the revived Ted Heath orchestra under Don Lusher. His contribution to music was honoured in November 2004 when he received the Coda Club's prestigious Burt Rhodes award. He died in August, 2010. Reg Owen (cl), Ralph Sharon (p), Dave Goldberg (g), Charlie Short (b), Jack Parnell (d). Soft Noodles*/Just You, Just Me*/Too Marvellous For Words/Riffet. Reg Owen (cl), Ralph Sharon (p), Dave Goldberg (g), Jack Fallon (b), Jack Parnell (d). Can't We Be Friends? */Stomping At The Savoy*/On The Alamo*/I'll Never Be The Same*. Jack Parnell (vib), Ronnie Scott (ts), Dave Goldberg (g), Norman Stenfalt (p), Charlie Short (b). Scrubber Time*/On the Sunny Side of The Street*/September In The Rain (unissued). Kenny Baker (tp), Reg Owen (cl,as), Dave Shand (bs), Norman Stenfalt (p), Dave Goldberg (g), Charlie Short (b), Jack Parnell (d). Tommy Whittle (ts), Norman Stenfalt (p), Dave Goldberg (g), Charlie Short (b), Jack Parnell (d,vcl). Sweet Lorraine (vcl JP)*/Old Man Rebop#*. Tommy Whittle (ts), Norman Stenfalt (p), Pete Chilver (g), Charlie Short (b), Jack Parnell (d,vcl). Hide Parker (unissued)/You've Got What It Takes (unissued). Bobby Pratt (tp), Tommy Whittle (ts), Frank Horrox (p), Sammy Stokes (b), Jack Parnell (d,vcl). White Suit Samba*/Go Go Go Go. Personnel: Jack Parnell (d, vocal), rest as detailed above. Quickie*/Juke Box Jumba*/Old Man Rebop*/Sweet Lorraine (vcl JP)*/Scrubber Time*/On The Sunny Side Of The Street*/On The Alamo*/I'll Never Be The Same*. Kenny Baker (tp), Don Lusher (tb), Betty Smith (ts), Tony Lee (p), Tony Archer (b), Jack Parnell (d). In November, 1992 Jack took his quartet to Ronnie Scott's to make an album, the last under his own name, Jack Parnell Quartet Live from Ronnie's for the Horatio Nelson label. Sadly, long out of print Jack's liner notes recorded that "This Album marks my 70th birthday, and 54 years in the music business. I'm doing what I love best, playing straight ahead LIVE jazz..."
Dean Masser (ts), mike Capocci (p), Mike Harris (b), Jack Parnell (d). Jamfs Are Coming*/Autumn Leaves*/Whisper Not*/El Cahon*/Aerigin*/Tenor Madness*/Alone Together*/Fried Bananas*/You Don't Know What Love Is*/Whee*. In the early 1990s Parnell recorded five CDs with veteran pianist Ralph Sharon. Sharon's Trio included Lennie Bush on bass with Parnell on drums. The CDs featured the Great American songbook with emphasis on a number of the major songwriters and Parnell's subtle drum work is a master class on how to play drums in a trio setting. Full details are on Ralph Sharon's... web page. Jack Parnell's popular commercial work as musical director for ATV through the 1970s and '80s has overshadowed his contribution to British jazz. He was a jazzman at heart and his long career started and ended as a jazz musician. For Simon Spillett "Jack was one of the most important contributors to the jazz scene in the UK, Britains first genuine drums star and a leader who actively encouraged his young charges in a range of delightful bands showcasing some of this country's finest talent." This page was last updated during November, 2014.